46% of U.S. adults in Feb. 15-19 survey would rather watch movies in theaters than via streaming if cost wasn’t a factor. 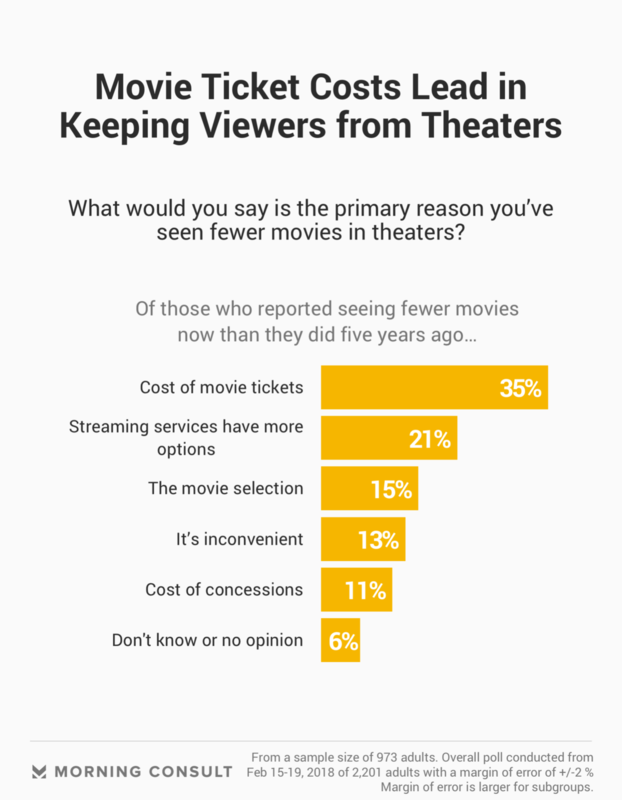 62% said they would likely spend more on concessions if a movie cost less. A service offering the chance to see one movie per day for under $120 annually has grown fast since a price cut less than seven months ago. And MoviePass continues to generate strong new consumer interest, Morning Consult polling shows. But it’s an open question whether over-usage by customers eats into MoviePass’ profitability. Thirty-nine percent of 2,201 adults surveyed in a Feb. 15-19 poll said they would be likely to purchase MoviePass’ limited-time deal for a movie a day for a one-time upfront cost of $115 — approximately $9.58 a month, including the processing fee. That excludes respondents who are already MoviePass subscribers. Since the poll was conducted, MoviePass, which normally costs $9.95 per month, has further reduced the price of that offer to $105 by cutting the processing fee from $19.95 to $9.95. With MoviePass, subscribers pay the monthly or yearly fee for the ability to see one standard 2D movie every 24 hours. MoviePass is available in more than 91 percent of all U.S. theaters, according to the company’s website. 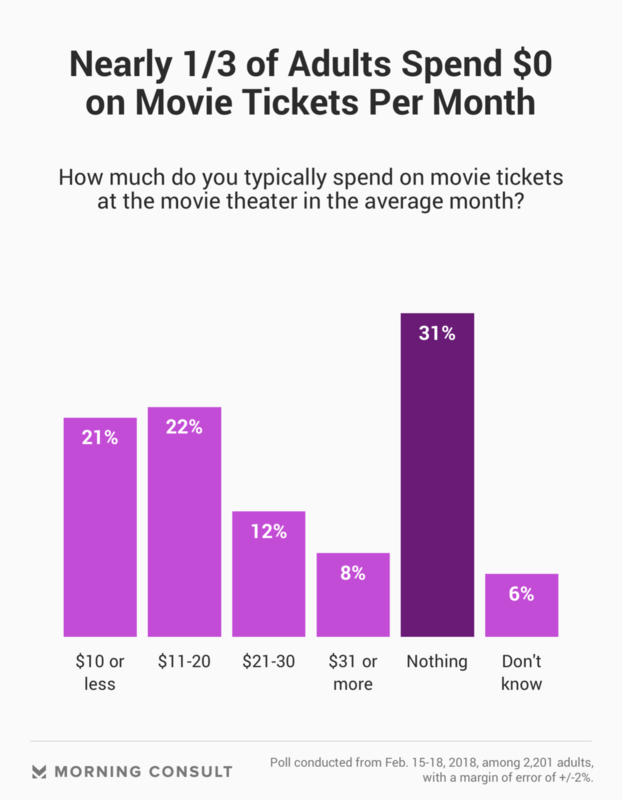 In the poll, 62 percent said they would likely spend more on concessions if a movie cost less, and 75 percent said they would see films in theaters more often. An increase in concessions purchases and customer base could prompt movie theaters to offer MoviePass benefits such as discounted prices on ticket sales. The company’s popularity has exploded since August, when Helios and Matheson Analytics Inc. acquired majority stake in the company. MoviePass slashed the price of unlimited movies from as much as $50 in some more expensive cities to the nationwide flat rate of $9.95 per month on Aug. 15. The number of subscribers skyrocketed from approximately 20,000 on Aug. 14 to more than 600,000 by Oct. 18. MoviePass announced Jan. 9 that it had reached 1.5 million subscribers, and on Feb. 8 announced it had hit 2 million. That may not be a road to profitability, said Peter Newman, head of the MBA/MFA Dual Degree program at New York University’s Tisch School of the Arts. The company pays full price for each ticket used by customers, and supports its low subscription price with a model depending on a sort of “gym membership mentality” where people won’t actually use the product as much as they think they will, Newman said in a Feb. 26 phone interview. MoviePass’ success may also be tied to declining movie theater attendance in an age of streaming offerings and other ways of viewing movies on demand. Forty-seven percent of U.S. adults surveyed in the recent poll said they won’t see a single movie in theaters in an average month. The Morning Consult poll — which has a margin of error of plus or minus 2 percentage points — found a 44 percent plurality of respondents said they are seeing fewer movies now than they did five years ago. Yet people crave the communal experience of seeing a movie in an audience, said Beth Egan, an associate professor of advertising at Syracuse University’s S.I. Newhouse School of Public Communications. Any potential profit for the company will come with the data it collects, Egan said. The company has not been quiet about its capacity to monetize the analytics it can offer about consumers to studios. A public relations representative for MoviePass declined to comment on the story, but pointed to previous statements MoviePass CEO Mitch Lowe and Helios & Matheson Analytics Inc. Chief Executive Ted Farnsworth have made touting the value of the information about consumer tastes and habits that MoviePass can accumulate. MoviePass also announced Jan. 19 at the Sundance Film Festival that it is getting into film financing with a wholly owned subsidiary, MoviePass Ventures, that will co-acquire films with film distributors. Not everyone is on board with the company’s ambitions. AMC Theatres, the largest American chain, criticized the company criticized the company in an Aug. 15 statement after its price drop, calling MoviePass a “small fringe player” that sets up consumers for “ultimate disappointment down the road if or when the product can no longer be fulfilled” due to an “unsustainable” price level. AMC did not respond to a request for comment on its current views of MoviePass. Then there’s the broader challenge concerning the theater industry — the appeal of streaming a movie at home. Forty-six percent of adults in the Morning Consult survey said they’d rather watch a movie in a theater if cost wasn’t a factor, compared to 43 percent who said they’d prefer to see it on a streaming service such as Netflix, Hulu or Amazon Prime Video. In an effort to counter that dynamic, MoviePass has begun limited partnerships with streaming service Fandor, which offers a library of more than 5,000 films, documentaries, classics, international features and shorts. The companies offered an $89.99 bundle to Costco customers beginning mid-December, and sold about 300,000 packages in just over two months, according to Fandor Chief Operating Officer Felice Oper. They then offered the bundle for a brief time directly on the MoviePass website for two weeks in February. Correction: A previous version of this story misspelled the name of MoviePass’ CEO.